A newly unsealed report from a risk-management expert found six different instances where sexual abuse allegations against former assistant coach Jerry Sandusky were either witnessed by other coaches or reported to university officials, including a 1976 allegation where one alleged victim made a report directly to head coach Joe Paterno. The documents are part of a court battle in which Penn State is trying to recoup from its insurance provider millions of dollars paid out in settlements to Sandusky’s victims. That insurance provider’s defense is that Penn State officials kept the allegations secret, and in doing so failed to prevent future instances of abuse. “Penn State should have notified PMA of the incidents involving Sandusky on a timely basis. Penn State did not do that,” Raymond Williams said. The documents were unsealed by a judge this morning, and PennLive.com and other local outlets are poring over them as we speak. One of the more important documents appears to be a report prepared by Williams, the risk-management expert hired by the insurance provider to determine when top university officials should have known about the raft of allegations against Sandusky, who was found guilty on 45 charges and will die in prison. A 1976 incident where one alleged victim made a report to Joe Paterno. 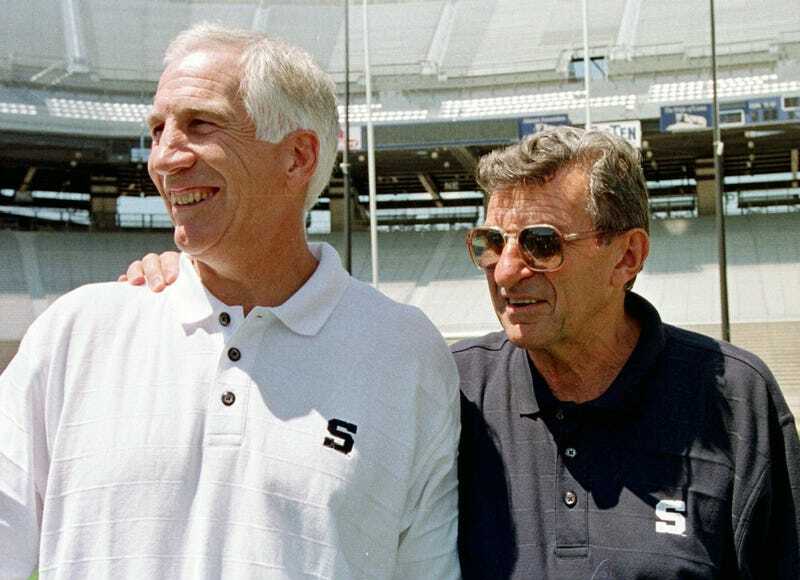 A 1987 instance of improper sexual contact between Sandusky and a minor that was witnessed by then-assistant coach Joe Sarra. A 1988 instance of improper sexual contact between Sandusky and a child that was witnessed by then-assistant coach Kevin O’Dea. A 1988 incident, the report of which was referred to then-athletic director Jim Tarman. Update, 9:49 a.m.: Here’s more detail on the 1976 allegation, from the victim’s 2014 court testimony. The allegations revealed today come from testimony and evidence provided in PSU’s settlements with the alleged victims. Williams was able to view documents concerning those settlements, but those actual documents remain sealed. Today’s release occurred only about 90 minutes ago. Expect more new information to surface over the course of the day.